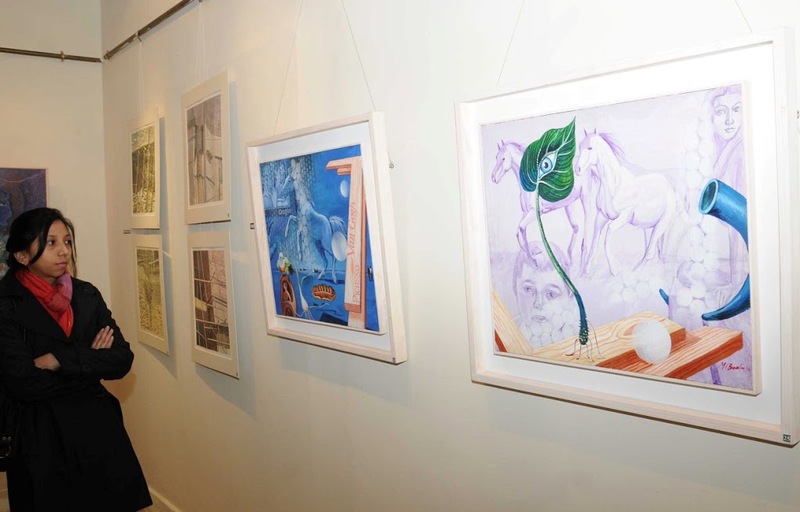 Artwork from Bangladesh based on surrealism titled ‘The International Show’ was put on display at the Nomad Art Gallery here on Tuesday. The exhibition includes the works of 10 eminent Bangladeshi artists offering a unique opportunity for the art lovers to relish the worldwide celebrated artwork in the capital city. The exhibition was inaugurated by the High Commissioner of Bangladesh Suhrab Hossain and will continue to be a source of delight for the public till December 21. The contemporary exhibition includes 33 paintings depicting the artwork of 10 Bangladeshi artists Mahabubul Islam Baabu, Syed Mohammed Shamim, Zahir Hossain Newton, Rezaun Nabi, Mohammed Fakhruzzaman, Anisuzzaman Anis, Abdul Aziz, Rajaul Islam, Shahin Akhter Lipi and Fehmida Khatun. Artists of the exhibition have not only grouped to follow common ideals of promoting peace, but “seeing their work one will easily understand that each of them is imbued with nature” said Ms. Hyat discussing the nature of paintings. The nature artists of this exhibition combined the theme of surrealism with figures, birds and horses to bring forward a message of peace to the world. Three of the ten artists were present in Islamabad representing the entire collection and to speak about it. Rezaun Nabi, who has 25 years experience as an artist presented his work with acrylic on canvas and water colour. Mahabubul Islam Baabu’s work with acrylic on canvas titled ‘Simultaneity’ presented the message of peace in a bizarre painting showing a horse and pigeon. “I believe animals are symbol of force. I use the bird dove because it is a symbol of peace and solidarity” said Baabu. While speaking to Pakistan Observer Baabu stated that he was inspired by Salvador Dali, the famous surrealist painter, “best known for the striking and bizarre images in his surrealist work” he added. As nature allures the impulses of creative mind, Hossein Newton’s work titled ‘Birds-1’ with acrylic on paper presented a bizarre yet peaceful image of colourful birds for nature lovers. Anisuzzaman Anis’ work is based on wood cuts along with mixed media and water colours. Wjhile Fahmida Khatoon with her brush strokes using water colour brings a versatile look to the group exhibition. Nabi Fakruzzaman, Aziz, Lovelu, Lipi and Shamim using mix media in diverse forms promotes the message of peace on the whole as well as present the unique art of the painters as individually accomplished artists.